I made another linen, metal zipper clutch. It's a wonder I haven't made 6 more (I guess it's those other obligations I have like my day job). Just like the internet, I am obsessed with these and could have one in every size and color. This one is a small size, for just carrying the essentials out or for using as a wallet, which is how I'm using it now. The construction is exactly the same as the larger version I posted about here, but you'll start with different dimensions. After the jump, I've got plenty more pictures to detail the process. Since the construction is the same as the larger clutch, I'll just make note of where the changes are. The final dimensions of this clutch will be 5"x8" (larger version here, is 11.5"x11.5"). Cut your exterior and interior fabric to 10"x11". Cut your zipper to 8". I added a small pocket to the inside. Since my fabric is a non-fraying I left it with raw edges. The piece is 3.5"x6" and sits in the middle of the lining, 1.5" from the top. Top-stitch onto the lining on three sides, leaving the top open. The bottom of the pocket is nearest what is the middle of your lining and will become the fold of the clutch. 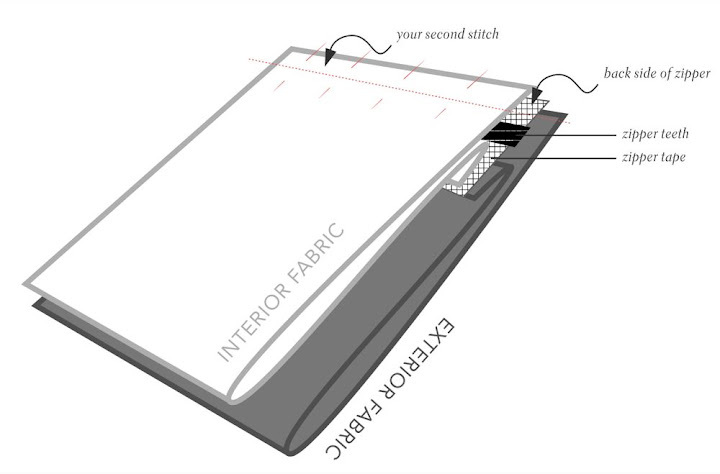 Just as instructed in the larger clutch tutorial, make a small piece of binding in your exterior fabric to wrap the raw edges of your zipper in. Once you've stitched your first zipper side down, complete the second. You'll fold the exterior fabric on itself--right sides together--with the raw edge aligned with the zipper's tape edge. Fold the interior fabric in the same way. Stitch all pieces together. Attach the zipper to the fabric on both sides. Press. In the dimensions I've given you I've included an extra inch so that you end up with more wiggle room on the raw edge shown above. I meant to do this myself, but forgot, of course. Stitch up the raw sides. Be sure to backstitch well over the top opening. Bind your interior raw edges. Flip inside out and press. Add a pull to your zipper. Done. I am obsessed with making these myself. I have been making them and sending them to my sisters as gifts. Honestly, thanks so much for a great tutorial. I found some amazing heavy weight fabric in the home furnishing section of a fabric store that I think will give these bags great structure. Thanks so much for this tutorial. I am attempting to make this small one right now! Unfortunately I'm stuck at the zipper attaching stage. I got the first side done but I can't figure out how to sew together the second side of the zipper! Does this make sense? Hi! Diagram to the rescue - I hope! I know what you're talking about. I always have to take a minute and get my head on straight at this step because I'll very easily sew something backwards. I made a new illustration and added a blurb - let me know if it helps! Thank you so much! Turns out I sewed the first side wrong but your diagram helped a lot. I plan on making more of these! Thanks for the tutorial, I do have one questions, when you say "bind up the raw edges" How did you do that. Did you put bias tape of the edges and sew? I know this is probably a stupid questions. Not a stupid question at all! I did use bias tape to bind the raw edges on the interior. You can buy some pre-made or make your own. Two-thirds of the way down on my quilt tutorial I talk about applying binding to edges. I just made one and I really enjoy the result. Thank you! Thank you so much for a great tutorial. I have tried other techniques for sewing a lined pouch - but this results in the most tailored and well resolved outcome: it's generous of you to share... and much appreciated! Okay, so you just attached your lining directly to the interior and then put the binding on the raw edges. That way you just fliperoo...inside out. Nice! I've been doing it where the lining is floating on the inside. Which is a bit more challenging. This looks as if you can actually get I cleaner look to the ends of the zipper...which is what I struggle with. I've made two bags with the floating lining and the ends of the zipper just look mangled. Hmmm, I'll have to try it your way on the next bag. I may have a whole lot of sewing notion bags before it's over but I am determined to get it looking as good as you have here. Thank you for this. 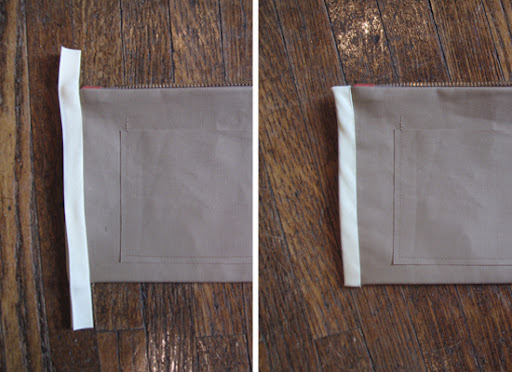 This is one of the most easiest way to learn how to make a small bag! Finally understand it! THANK YOU! Is it possible to have topstitching on the outer fabric up near the zipper for a finished look? I can't figure out how to do it.